If you’re talented with a lens and enjoy capturing the life around you on film, listen up! 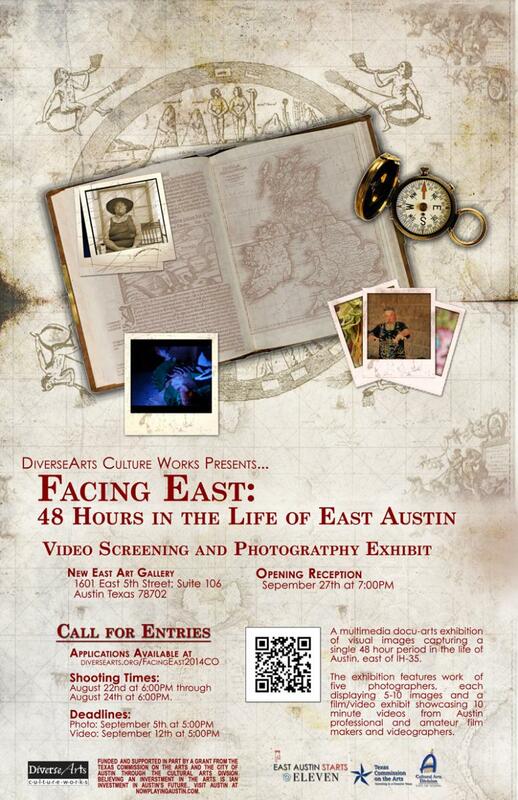 DiverseArts Culture Works is calling for submissions for the 14th annual production of Facing East: 48 Hours in the Life of East Austin. Facing East is a multimedia docu-arts exhibit of visual media, shot within a single 48-hour period in East Austin (east of IH 35). Artists will shoot between 6pm August 22nd through 6pm on August 24th 2014 to capture a brief portrait of life on the East Side. Each photo series, film or video must include at least one image, frame or time/date burn that documents the date shot. A time/date prop will be on display at both the New East Arts Gallery (1601 E. 5th, #106) and Kenny Dorham’s Backyard (1106 E. 11th St) during shooting times. This project is part of DiverseArts’ larger mission of collecting and documenting archival materials on the history and current life of Austin’s East End Cultural Heritage District. DiverseArts seeks submissions that reflect different perspectives of East Austin’s rapidly changing—and in some ways, unchanging—landscape. Submissions will be accepted until September 12th at 6:00pm. A panel of judges will evaluate the submissions and choose the best among them to hang in the exhibition. Participants will be notified on September 19th to confirm whether their submissions are chosen. Those chosen will have selections of their work featured in an exhibition at New East Arts Gallery starting September 27th. The judges will award Best of Show to the strongest piece from each category (Photography and Video), and the winners will receive prizes of cash and supplies. For more information, guidelines and entry forms visit www.diversearts.org, the New East Arts Gallery and various other locations in Austin. DiverseArts is funded in part by the City of Austin through the Cultural Arts Division and by a grant from the Texas Commission on the Arts and an award from the National Endowment for the Arts, which believes that .....a great nation deserves great art.